The Sumatran Rhino is the smallest and hairiest of all rhinos. Their favourite pastime is wallowing in mud baths where they relax for up to 300 minutes per day! The remaining populations of the rare Sumatran Rhino, also known as Hairy Rhino or Asian Two-Horned Rhino, can be found in the hilly areas of tropical rainforests on the Indonesian island of Sumatra and the Kalimantan province of Borneo. For the first time in 40 years, the Sumatran Rhino was spotted in Borneo. It is the smallest and the hairiest of the of the rhino family. Usually, their reddish-brown skin is covered in patches of short, dark coarse hair with longer, thicker hair around their ears and tail. They weigh approximately 800 kg (1760lbs) which is less than half of the African Rhino and only grow to around 1.5 meters (5 feet). The Sumatran Rhino is the only Asian rhino that, like the African sub-species, has two horns. The larger horn known as the “nasal” or “anterior” horn grows from the nose, measuring between 15-25cm(5.9-9.8in). The other, much smaller horn, is located between the eyes called the “posterior” horn only measuring about 10cm (3.9inches). The horn is not used for fighting but for helping Rhinos pull down vegetation to eat and for scraping mud from the sides of wallows. They will eat leaves, twigs, bark and fruit, but they have also a bit of a sweet tooth for mangos and figs. They are most active at dawn and dusk, during their meal times. After a long hard feeding session, they will spend most of their time relaxing in mud baths. In fact, they bathe for between 80 and 300 minutes every day! This mud wallowing is an essential pastime as if it helps them keep cool and protects their skin from diseases and insects. They are solitary and territorial animals. Males will claim up to 5000 hectares as home turf, sometimes overlapping territory with females, who claim 1000-1500 hectares. To avoid bumping into each other they will mark their territory with dung and urine, and by scraping the ground with their feet. 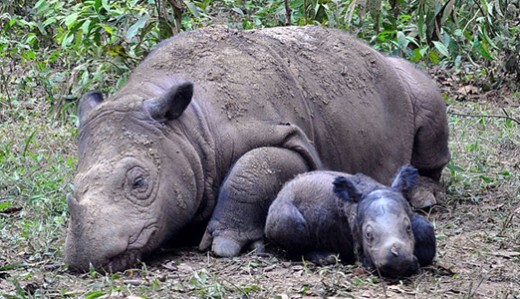 Sumatran Rhinos will only give birth to one calf at a time. In the wild, Sumatran Rhinos can give birth every 3-4 years but in captivity it is very rare. Only one captive Sumatran Rhino has given birth in 100 years! Calves will stay with their mothers for 16- 17 months. Sometimes, after leaving their mothers, young Sumatran Rhinos will join together before braving the solo lifestyle. They can live for up to 30-40 years in the wild, but as they are so rare this is only an estimate. The Sumatran Rhino is Critically Endangered. They used to roam parts of Asia from India to Thailand, Lao, Cambodia and the Indonesian Islands, Java and Borneo. However, like their cousins, the Black Rhino and the Javan Rhino, they have been aggressively poached for their horn putting their survival at risk. The Sumatran Rhino has been roaming planet Earth longer than any other living mammal, but time is running out for these ancient creatures.